The 4th of July is such a great excuse to kick back with friends and family, enjoy a cold beer or any beverage of your choice and fire up the grill. The 4th is laid back summer fun at its finest. 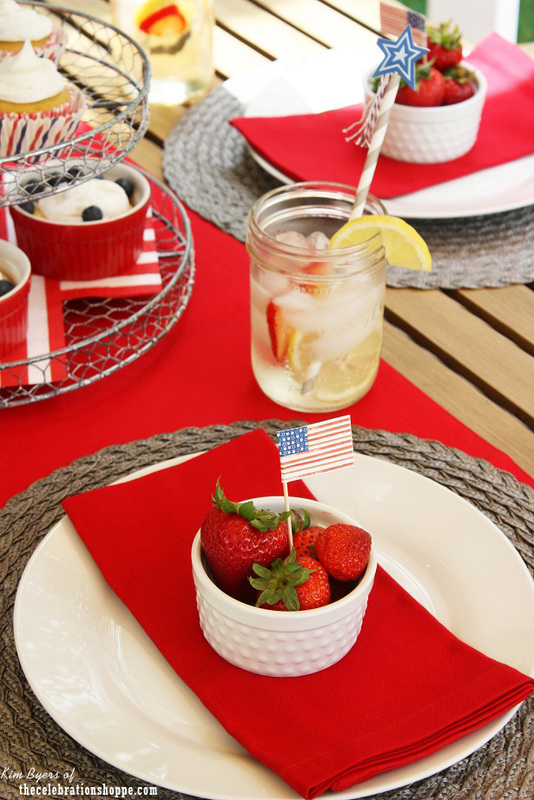 If you are throwing a party for this patriotic day, you don't want to fuss with fancy party decorations. I've pulled some of the easiest and quickest DIY party decoration ideas in history. So you can take a few of these and plan your perfect July 4th bash without breaking a sweat. 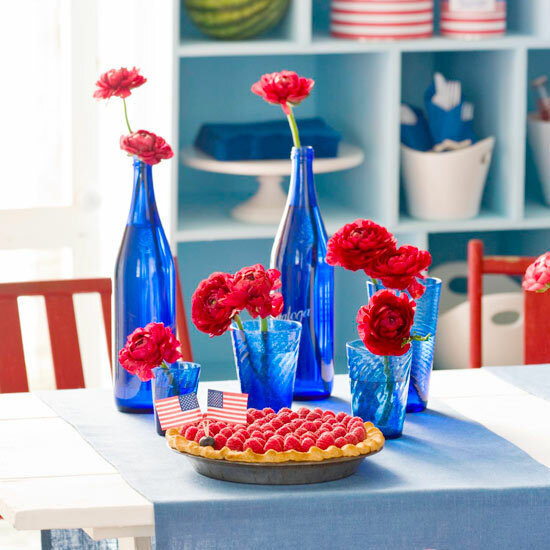 Set a pretty table in no time with extra touches like individual servings of berries at eat place setting and sliced fruit in a clear pitcher. This might be my favorite idea ever - I love this blue glass. In fact, if I was having a bash myself I would use blue glass since I actually have some that I've never used. Le sighhhh. There's always next year. 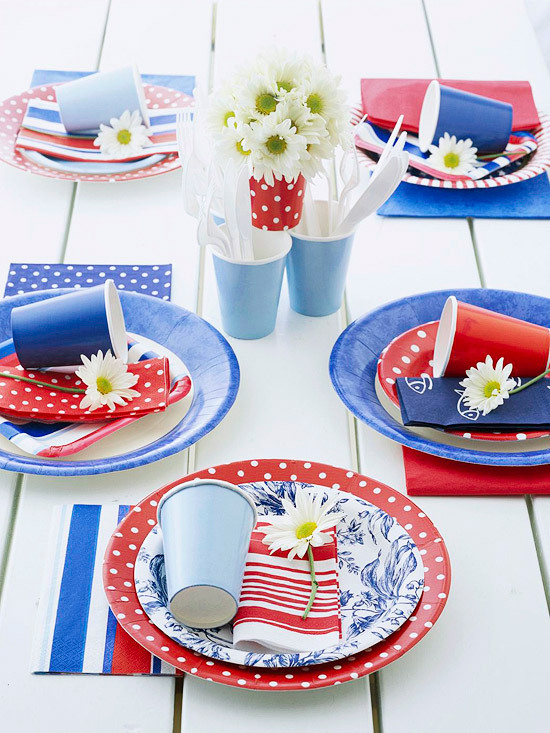 Nothing says laid back like paper plates - so I absolutely adore this table with carefully coordinated and cute paper plates, napkins, cups and silverware. It will take you longer to finish your first beer than it will to clean up this table- that's my kind of cleaning! This next photo solves 2 problems - you're feeling a little crafty and you need a cute way to display silverware. I love these craft paper bags! Get the kids involved and see what sort of festive designs their imaginations can come up with! This next idea is brilliant. Store everything your guests need in a pretty galvanized bucket for an adorable presentation. The bucket could be a take home party favor! 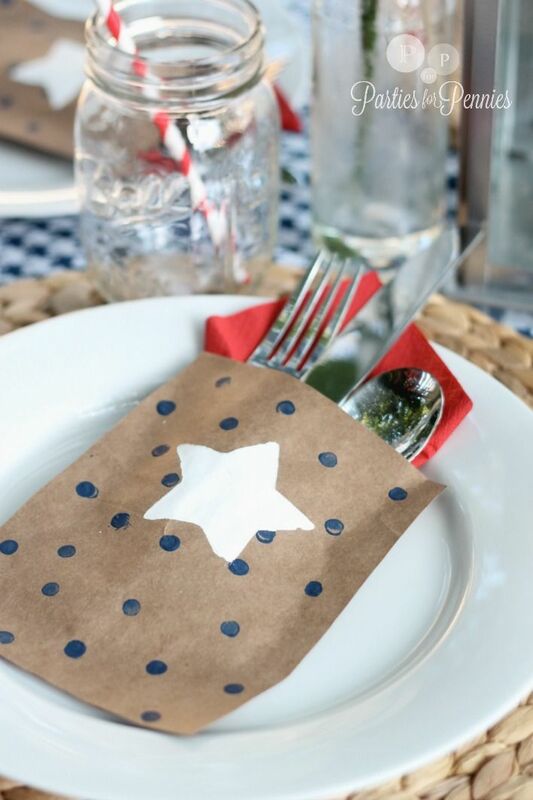 Using burlap or even craft paper, hand stamp red white and blue stars for a simple DIY table runner. 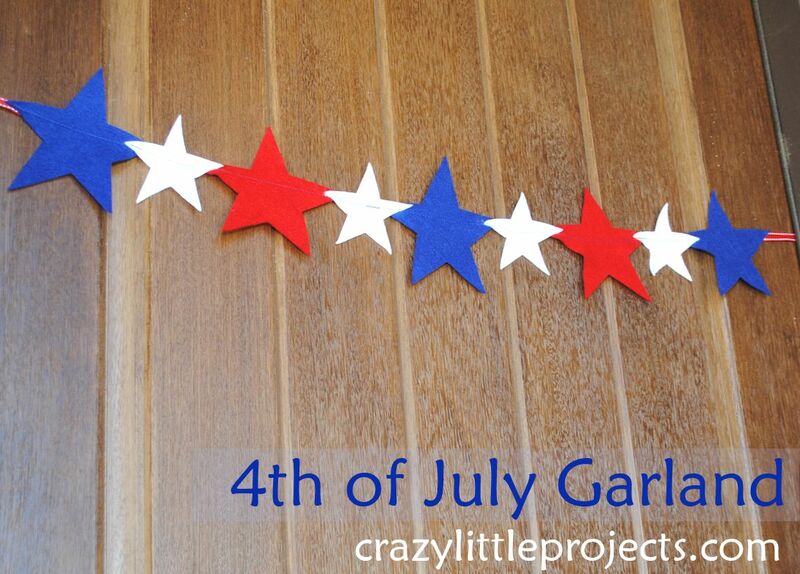 The best part about this star garland is that you can save it and use it year after year! Hang withs from the mantel, on the front door, on your deck - the possibilities are endless! 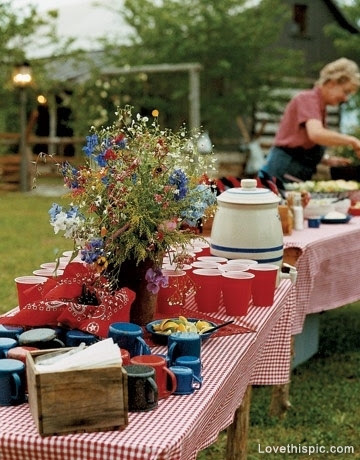 I love this country buffet set-up. The gingham cloth is perfect and so are the red solo cups. "Red Solo Cup....." (now the song will be in my head for the rest of the day). 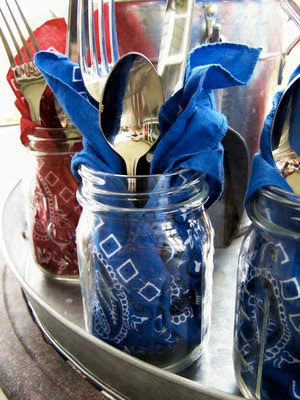 Red and Blue bandannas serve as napkins and decorations when you use them in mason jars. Love this idea! 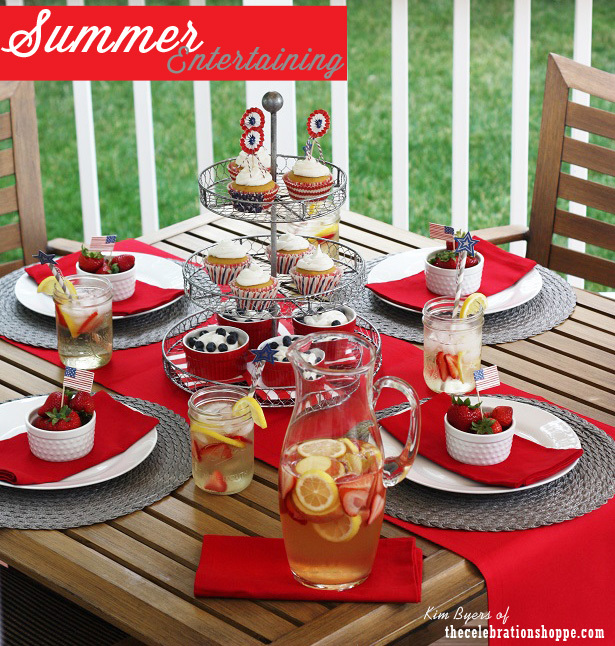 And even though this post is about decorations, and not food, I can't help but include a super easy 4th of July treat. Because let's face it, food is always on my brain. 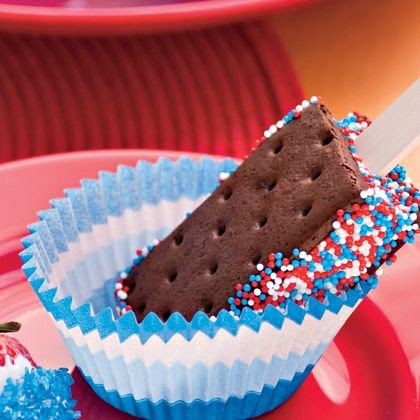 Take ice cream sandwiches and roll them through red, white and blue sprinkles for a simply fabulous presentation. Hope you have a great weekend! Mr. Fo and I plan to spend some time kayaking at the US National Whitewater Center. We will then follow that up with an ice cold brew and time spent watching the white water rafters fall out of their rafts. Hee hee. Been there, done that! Such adorable ideas! I hate to say it, but everything’s about being disposable for us these days. If only I could pull off as cute a table with our disposable plates!